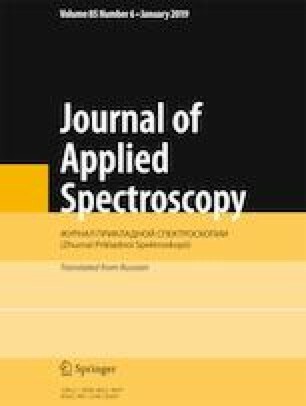 The aim of this work is to establish the correlation between differential scanning calorimetry and Raman spectroscopy in the determination of the mechanical properties of TiO2/epoxy resin nanocomposites. Commercial RTM6 epoxy resin with TiO2 nanoparticles of 21 nm in diameter is used. Magnetic stirring for 5, 30, and 60 min is employed for the preparation of this epoxy. The rate of the reticulation of epoxy is reinforced by different percentages of TiO2 nanoparticles and is strongly affected by the cure temperature. The results indicate that the 1255 cm–1 peak intensity, corresponding to the C–C stretch, decreases during the cure leading to the variation of the mechanical properties (hardness) of the nanocomposites. Published in Zhurnal Prikladnoi Spektroskopii, Vol. 86, No. 1, pp. 78–83, January–February, 2019.